This faith and justice work only happens because of generous volunteers and donors. There are many ways to join in. Your time, treasure and talent complete the circle. You make it possible for hundreds of grassroots faith leaders, like Pastor Sseba and his congregation to make a difference where it matters most: passionate, local voices working on homelessness, affordable housing, Immigrant & refugee support, and racial justice. You can build a bonfire of justice, bright enough to reach every neighbor. We all have the capacity and the audacity to join this great work. With just one mouse click, you can begin transforming our region. Make an online gift or pledge via credit card through our secure web portal. Checks made payable to Church Council of Greater Seattle may be mailed to: PO Box 18467, Seattle, WA 98118. Many churches, denominations and faith agencies support the Church Council because of the role we play as a regional ecumenical council. If you are interested in encouraging your church to make a donation, we can support your efforts as you inquire with your mission board, pastor’s discretionary fund or special projects team. Please contact us directly to make a gift through an electronic stock transfer. Our accountant Janet Deters can help you arrange this. Contact Janet at (206) 525-1213, ext 104 or email Janet. Contact us to see if your unneeded items match our needs. Contact Beth Amsbary at (206) 525-1213, ext 103 or email her. There are many options for joining in faith-filled justice-making — from participating for a couple of hours to making a year long commitment. We can help you find the best fit for your time and skills. Through an internship you could learn to be a justice organizer or get real-life experience in nonprofit management. Or you could learn the basics of event management. The Church Council works with several education and service learning programs including those at Seattle University, Seattle Pacific University, and the Justice Leadership Program of the United Church of Christ. Opportuniteis to pitch in and help vary from office work to advocacy. Volunteers host special events, participate in social justice action groups and engage in community organizing. We also welcome those seeking opportunities for fulfilling community service obligations. The Rev. Dr. Bill Cate Fund for Emerging Justice Leaders fulfills the vision of this remarkable community leader to empower young community activists on their journey. Your gift to this fund will train and support the next generation of faith-inspired justice-makers. The Rev. 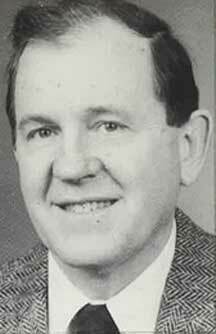 Dr.“Bill” Cate changed the face of our region. In partnership with his wife, Jan, Bill ushered in a new generation of faith-inspired justice-making. 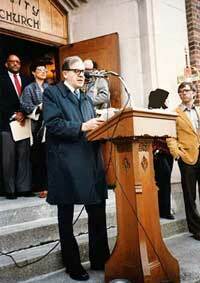 Bill served as President-Director of the Church Council of Greater Seattle for twenty years, from 1970-1990. 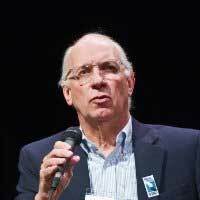 A trademark of Bill Cate’s leadership was his ability to empower grassroots leadership: find emerging voices, listen to them, support them in doing good works, and stand by them when they got into difficulties. The Church Council of Greater Seattle regularly brings in young adults who hunger and thirst for justice to join the work. These emerging justice-makers learn to organize, frame campaigns, and deepen their own spirituality. They head out, ready for a lifetime of making a difference, just like so many activists who launched their organizing work under Bill Cate’s guidance. Jesus’ path to justice, rooted in faith, is needed now more than ever. And supporting emerging justice leaders, keeping alive the legacy of Bill Cate, is needed now more than ever. Join the movement by making a gift online. You may make a one-time gift, an automatic payment pledge, or include this fund in your will or other legacy planning. This description provides only the briefest summary of Bill Cate’s legacy. For more information please download our flyer, About the Cate Fund, which provides more information, including a mail-in form. Your Employer Wants to Help Too! Many employers make donations to match your gift, or allow you to donate through payroll deductions. Ask your Human Resources department for a matching gift form and send it in with your gift. We’ll take care of the rest. Your gift may be doubled or tripled! The Church Council of Greater Seattle’s Federal Tax ID number is 91-0460490. King County Employees: Our code for your King County Pledge Form is 9266. Federal Employees: Our code for your CFC Pledge Form is 43738. Through your estate plans you can ensure that our mission of unity, compassion, and social justice continues on for future generations. Planned giving offers many ways to support, and it is possible for anyone, regardless of their means. 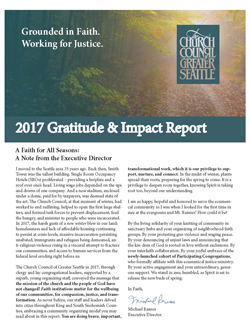 We hope you will consider giving a gift to the Church Council of Greater Seattle that will live on through the years. A bequest in your will is the most common planned gift but there are other options as well. Some of those options are a charitable gift annuity or charitable remainder trust. You might also name this cause as a beneficiary in a life insurance policy or retirement account. We’re here…to make this process as easy as possible for you. For questions or more information, contact Beth Amsbary, Philanthropy Manager, at 206.525.1213, ext. 103. We have assembled some documents that you may find helpful for gifting and/or estate planning. Follow the links below to download these PDFs. Our Legacy Society is made up of a group of inspirational individuals committed to the future success of the Church Council. Your membership involves no dues or obligations, but it does allow us to thank you and recognize you for the generous plans you have made. As a member of the Legacy Society, you will receive benefits including recognition in publications such as our Annual Report. For more information, contact Beth Amsbary, Philanthropy Manager, at 206.525.1213, ext. 103. Through sponsorship, you can align your organization with the region’s Christian community for the common good. Our work bridges faith communities with partners from all sectors — business, non-profit, labor, and neighborhood organizations. Your financial sponsorship not only boosts the work of faith-based civic activism. It also tells local Christians that you are invested in their vitality. Sponsor the Weaving Our Strengths Conference. Weaving our Strengths brings together more than 200 people from over 50 faith communities. It’s the perfect place to showcase your dedication to the region, as people from many churches will gather for training, resource-sharing, and fellowship.This year’s conference will be held on Saturday, September 30 at University Congregational United Church of Christ in Seattle. Interested in other sponsor opportunities? Let’s talk about options to support other areas of work, such as interfaith dialogue, racial equity, or the Immigrant & Refugee Support Network. 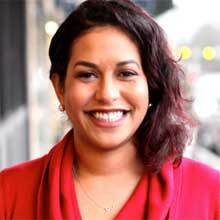 Please contact Beth Amsbary, Philanthropy Manager (206)525-1213 ext 103 or Email Beth. We are grateful for the many ways that individuals, businesses and organizations step up to sponsor specific priorities and activities related to our common work. Please join us in appreciation of the sponsors listed below. King County Employees: Our organization code for your King County Pledge Form is 9266.